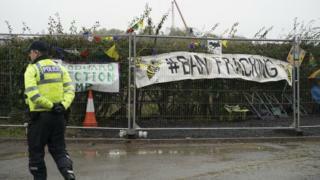 Three people have been charged by police after protesters climbed up a 60ft (18.2m)-high rig at a hydraulic fracturing site. Two men and a woman got into the site at Kirby Misperton in North Yorkshire in the early hours of Saturday. A 29-year-old man has been charged with criminal damage and aggravated trespass, said North Yorkshire Police. A 28-year-old man and a 21-year-old woman are also facing charges of criminal damage. The latter two have also been charged with hindering lawful work, an offence under the Trade Union and Labour Relations Act 1992. Those charged are due to appear in court in December, said the police. Third Energy was given planning permission to operate on the site in May 2016. It has not received final consent to begin fracking but expects to start before the end of the year. Fracking is the process of drilling down into the earth before a high-pressure water mixture is directed at rock to release the gas inside. Opponents say it can cause water contamination, earthquakes and vehicles going to and from the site could lead to noise and traffic pollution.